President, the Nigeria Volleyball Federation (NVBF) Engr. Musa Nimrod has bagged the prestigious Authentic Sports Personality of the Year 2017 Award. “I have been challenged by this award and it is highly appreciated. It is a huge challenge that will make me do more. “We would be introducing new things to the federation that would make it outstanding, following suggestions we are getting,” he said. Nimrod, who is the Garkuwan Matasa Arewa further said, God has been faithful to him in several ways, while appealing to all for prayers for more grace. “Just within a couple of days, three of my workers suffered terrible accidents with each of the separate incidents resulting to damaged vehicles, but I thank God for his grace that sustained them and no life was lost, ” he narrated. he was humbled and elated that he was able to beat sports personalities like Nigeria Football Federation (NFF) Director Technical, Ahmed Fresh to claim the award through votes from readers. 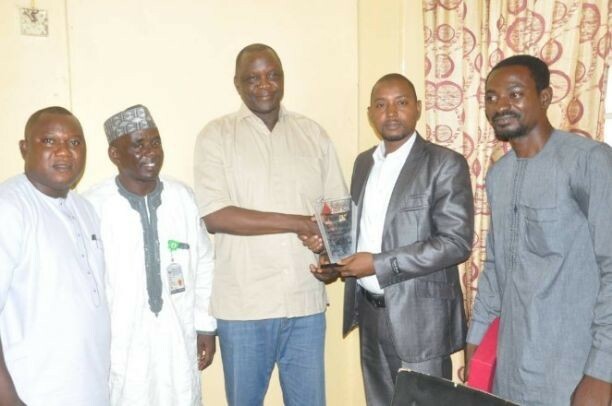 In a remark, the Director of Sports Kaduna State, Yakubu Ibrahim said that the award was well deserved. “First time I came to the Ministry, first person I was told about was Engineer Nimrod. They told me all he is doing for sports development not just in the state, but entire country and advised me to draw him close, if I want to be successful as a Director of Sports, ” he said. He praised the management and staff of Authentic News Daily for always ensuring prompt publishing of news items, as well as the transparency in the emergence of the recipients of the award. Another recipient of the Authentic Reporter of the Year 2017, Isaiah Benjamin of Leadership Newspapers was also presented with his award at the same occasion. Notable personalities that were present at the ceremony, include the Nigeria Union of Journalists (NUJ), Kaduna Council Chairman, Comrade Adamu Yusuf, SA Culture to the Kaduna State Commissioner of Youth Sports and Culture, Christopher Yashim Iliya, Secretary of Kaduna United Football Club, Florence Yori and the Consulting Editor, Authentic News Daily.